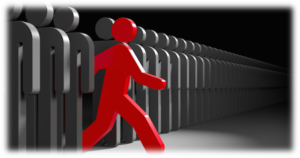 Home » News & Events » WEBINAR: Differentiation in a Federal Market: How Do You Stand Out? With the federal contracting market exceeding half a trillion dollars yearly, and additional potential revenue from other public-sector markets including state and local, K-12 and higher education, companies (large and small) are trying their best to position themselves to take advantage of opportunities and establish themselves with potential customers. However, as these markets have matured, millions of marketing and advertising dollars have been invested and companies are finding it harder and harder to clearly differentiate their products and services in this over-saturated public-sector market. Market Connections and Boscobel Marketing Communications have been reviewing the online materials, positioning and taglines of some of the top federal government contractors. This recent evaluation revealed that many companies sound, and even look, the same. Leveraging analysis from the Market Connections research team, president Aaron Heffron will review how the top government contractors have (or have not) differentiated themselves in the federal cyber security market. Boscobel CEO, Joyce Bosc will present an analysis of top 100 contractor taglines, highlighting similarities, and differences, and the challenges marketers are facing as they try to present new and old brands in the market. Please join us to see how your company stacks up against your competitors and to hear best practices in ensuring that you are putting the best foot forward into the lucrative public-sector market. Do Federal Workers Believe What They Read, Hear or Watch?